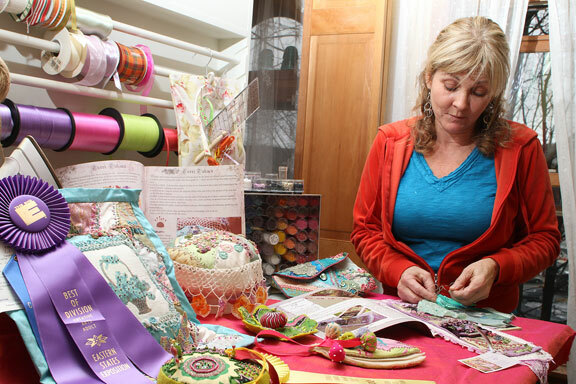 NAUGATUCK — Terri Takacs’ studio is crammed with color-coded thread, hand-dyed ribbon, and beads, all arranged in neat little holders along the wall, drawers, and cubby-holes. Takacs uses the materials to stitch together scraps of fabric with intricate designs into pillows, purses, and quilts. This style of “crazy quilting” with irregular shapes and embellishments has been around since the late 1800s. Takacs’ pieces feature “silkies,” replicas of turn of the century photos printed on fabric that cigarette companies used to include in packages to entice women. She said women used to use scraps of clothing and cover rips in the fabric and seams with pretty stitches. “They don’t really know what to do with me,” she said. Takacs’ passion for quilting started over a decade ago when her mother bought her a book on stitching. Soon after, she took a quilting class at Naugatuck High School. “I’ve just been doing it on my own ever since,” Takacs said. For Takacs, each quilt has a special meaning. Some are for friends going through hard times. Some include pictures of lost loved ones and pets. Twice, Takacs said she was inspired by an obituary picture and made a piece which she sent to a complete stranger. Takacs said she would like to make money with her hobby, but it’s hard. 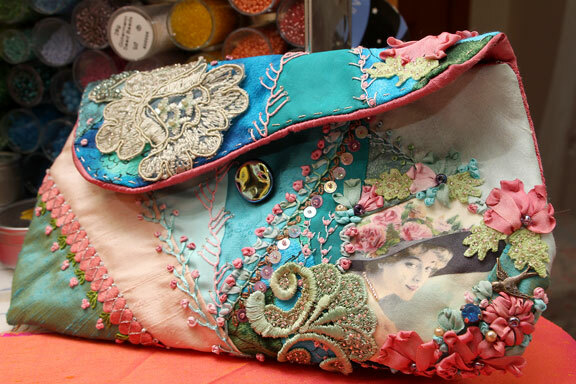 She recently sold a change purse that took her three long nights to create for $32. “So far it’s been more of a way to give,” Takacs said. While she gives most of her work away, Takacs is keeping one piece for herself. Each month, she is creating a block, which will eventually become a quilt to hang in her home, and posting it on her blog. Takacs said she was almost embarrassed to admit how much time she spends on her projects, which averages about four hours per day. “It’s pretty much my life, besides my family,” she said. Besides her husband, Takacs has four children and two dogs to keep her busy. When it comes to making her crazy quilts, Takacs said she likes to sit down with a Red Bull and some music and let her creative side take over. “It creates itself, really,” she said. With crazy quilting, there are no rules. “You have to be comfortable with your creativity and confident in yourself that you’re going to creating something beautiful,” Takacs said. She said everyone should have something they are passionate about. “It’s like a spiritual thing to me. … It’s a great feeling,” Takacs said. Local Creations is a series that will highlight the creative side of a local resident.